Russia’s deputy finance minister has said that pending legislation on digital currencies is likely to include a ban on bitcoin payments. Additionally, he implied that discussions on the regulation of the cryptocurrency are still continuing in the State Duma, Russia’s national legislature. The draft law on the regulation of digital currencies is expected by next month. Previously, Anton Siluanov, Russia’s finance minister, said that the regulation bill would be ready within a year. For months, the discussion of how to regulate bitcoin payments in Russia have continued. Yet, while debates remain, the Central Bank of Russia has questioned whether it should be classed as a currency. In June, Elvira Nabiullina, governor of the central bank, said that she views bitcoin as an asset. She added that the bank had concerns about the cryptocurrency. At the time this news was quite significant from the country. A year previously, Russia’s Finance Ministry was threatening prison time for anyone using digital currencies. A new amendment was placed under the Criminal Code. Management and executives of banks and financial service firms faced up to seven years. However, every day individuals faced prison sentences of up to four years. It remains to be seen whether the country eventually recognises digital currencies in 2018. The market remains a popular one, which can be seen by its steadily rising value on a daily basis. Interestingly, earlier in September, Siluanov was reported to be working on a law to regulate digital currencies by the end of 2017. As the Russian government has become more accepting of them, Siluanov stated that there was ‘no point’ in banning them. However, given the country’s stance on the crypto market in the past, delays to when the bill will be ready are expected. News that Russia won’t be legalising bitcoin payments comes at a time when the market is seeing an uptick in value. At the time of publishing, on the 29th September, the digital currency is trading at $4,180, a 0.73 percent rise in 24 hours. In seven days its value has increased by 15.96 percent. Its market value is currently worth $69.3 billion. For much of September, though, the digital currency has been hovering below $4,000. This was primarily to do with Chinese authorities prohibiting the operation of domestic digital currency exchanges. Yet, negative comments from various individuals may have also impacted its price. Namely, from Jamie Dimon, the CEO of JPMorgan Chase. According to him, bitcoin is ‘a fraud’ that ‘won’t end well.’ In his opinion, the cryptocurrency will eventually blow up. He also claimed that he would ‘fire in a second’ any employee found trading in bitcoin. Understandably, his remarks ignited a backlash from industry leaders. The most notable, of which, was from a fellow bank CEO. These comments will no doubt be refreshing to hear. Not only that, but the fact that they were uttered by a bank CEO illustrates the impact that bitcoin and bitcoin payments are having. The fact that some bank CEOs can’t see this may indicate that they are ‘probably afraid’ of the currency and the technology behind it. While bitcoin payments are expected to be banned in Russia that’s certainly not the case everywhere else. Japan’s Financial Services Agency (FSA) is to begin monitoring Japanese bitcoin exchanges from October. According to the Japan Times, the move is to ensure that digital currency exchanges have the correct internal systems, such as protecting customer assets, in place. If not, on-site inspections will be carried out. In April, a revised payment services law went into affect. This set out operational standards for digital currency exchanges in addition to recognising bitcoin as a legal form of payment. As a result, there has been strong trading from Japan, which helped push bitcoin’s price up to $5,000 at the beginning of September. According to an FSA executive, the move is to ensure the development of the market and to regulate bitcoin exchanges. By the end of September, all cryptocurrency exchanges operating in Japan are required to register with authorities. The revised law includes anti-money laundering (AML) and know-your-customer (KYC) regulations. To monitor the more than 20 bitcoin exchanges in Japan, the FSA has established a team of 30 members with the relevant expertise. The team will determine whether the exchanges have the appropriate risk management measures in place, including how to respond to cyberattacks. Japan is no stranger to incidents involving the lose of customer assets in the digital market. The now-defunct bitcoin exchange Mt Gox is well known for its notorious past. In 2014, the exchange collapsed, which saw the loss of millions of dollars in customers’ funds. The exchange’s failure is considered a vital component in pushing Japanese authorities to regulating the market. This move comes at a time when Chinese authorities have outlawed initial coin offerings (ICOs). After this announcement came the call to stop prominent domestic digital currency exchanges from operating in the country. Naturally, news of this saw market prices plummet. So much so, that on the 15th September, bitcoin’s price was trading at $2,947. As a result, its market cap was pushed down to $48.8 billion. Following China’s move to halt bitcoin exchanges, several have already revealed when they will be closing. Chinese exchange BTCC is expected to stop functioning at the end of September. However, ViaBTC, will cease operations today, as of the 25th September. OKCoin and Huobi will halt their operations at the end of October. They have been given extensions due to the large number of users on their platforms and because neither listed ICO trading pairs. Reportedly, ViaBTC will relaunch its platform overseas; however, it’s not know when the relaunch will take place. Since achieving the $5,000 mark at the beginning of September, bitcoin’s price has been on a roller coaster ride. This has been greatly brought about by China’s move to crackdown on the market. However, today, the digital currency is showing some signs of improvement. At the time of publishing, bitcoin’s price is trading at $3,897, a 4.81 percent rise in 24 hours. In seven days, though, its value has dropped by 1.23 percent. Its market cap is currently worth $64.6 billion. Yet, it still has a way to go before it can attain its $75 billion market cap it achieved at the beginning of September. At present, the combined market value is worth $135.4 billion. This, too, is a significant drop from its near $180 billion market value from the start of the month. Only time will tell whether bitcoin’s price can once again reach new heights. Despite this slight setback in price many people remain confident that it will rise again, even further than what has already been seen. To the Moon for Bitcoin? Tom Lee, a Wall Street strategist and co-founder at Fundstrat, an independent research boutique, providing market strategy and sector research, believes bitcoin will rise to $25,000 in five years. Additionally, he states that it will remain the best asset to invest in to the end of 2017. According to Lee, there’s no point in projecting bitcoin’s price two months from now. Instead, looking at its long-term future is the way forward. Veteran trader masterluc has predicted a bullish price of $15,000 for bitcoin by the end of 2017. According to the trader, bitcoin will continue its bull run into 2019. At which point, the trader believes it will be worth between $40,000 and $110,000. Despite the confidence in the currency, not everyone thinks the same. Additionally, he stated that he would ‘fire in a second’ any employee found trading in the digital currency. One report suggests, though, that the CEOs of major U.S. banks are ‘probably afraid’ of bitcoin and the blockchain. Rainer Michael Preiss, executive director at Singapore-based Taurus Wealth Advisors, thinks this is because cryptocurrencies are becoming a viable investment alternative for people. A market abuse report has been filed against JPMorgan’s CEO after ‘spreading false and misleading information’ about bitcoin. The report in question was filed by London-based Blockswater, an algorithmic liquidity provider. It was filed with the Swedish Financial Supervisory Authority against JPMorgan and its CEO Jamie Dimon. On the 12th September, Dimon took a shot at the digital currency stating that it ‘won’t end well’ and that it will eventually blow up. 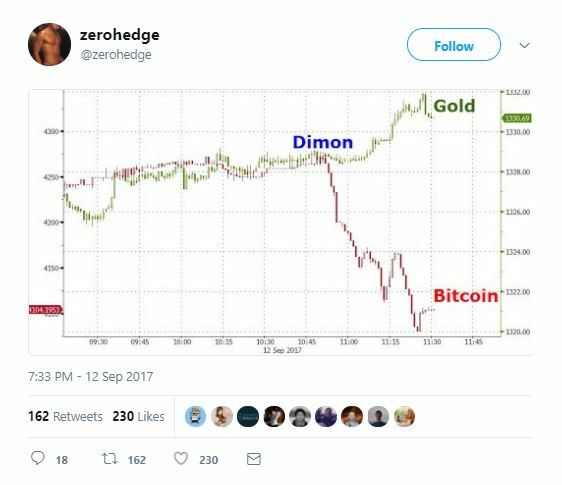 After Dimon’s comments one observer noted that the cryptocurrency dropped in value. According to the complaint, Dimon’s comment impacted bitcoin’s price negatively as the ‘cryptocurrency’s price and reputation’ dropped. Since Dimon’s comments questions have been raised as to why the bank handles bitcoin-related client trades. According to a report, most Wall Street banks use the Bitcoin XBT platform to act as agents for buyers and sellers. JPMorgan does so too. Yet, a spokesperson for the bank said it doesn’t trade with its own capital. As a result, Schweitzer has asked the Swedish regulator to investigate. He notes in his complaint that market abuse in Sweden is punishable by up to two years in jail. Interestingly, one wealth advisor believes that CEOs of major U.S. banks are ‘probably afraid’ of bitcoin and the blockchain. His comments are in light of Dimon’s remarks about bitcoin. Preiss believes that due to a bank’s lack of transparency, cryptocurrencies are becoming a viable investment alternative for people. Additionally, he believes that bitcoin remains ‘a good store of value.’ This is down to the fact that its price has risen from $7 to $5,000 since January, 2014. Bitcoin reached the $5,000 mark on the 2nd September when CoinDesk’s Bitcoin Price Index (BPI) recorded it at $5,010. Chinese bitcoin exchange OKCoin recorded the currency’s price at $5,149. At the time the combined market cap was worth nearly $180 billion. At the time of publishing, on the 21st September, it’s valued at $124.8 billion. Since the announcement from China that it is outlawing initial coin offerings (ICOs) and cracking down on domestic digital currency exchanges, bitcoin has seen its price drop. This is due to the fact that several prominent exchanges will cease their operations. At the end of September Chinese digital currency exchanges BTCC and ViaBTC will suspend their functions. Meanwhile, OKCoin and Huobi are expected to stop operating at the end of October. It’s believed this is because of the large number of users on the platforms and because neither had listed trading pairs for ICO tokens. So far since this announcement the number one digital currency has dropped below the $3,000 mark. On the 15th September it was recorded at $2,947, pushing its market cap down to $48.8 billion. Since then, however, it has improved. So much so, that on the 19th September it was trading at $4,090, pushing its market cap back up to $67.7 billion. Yet, uncertainty still reigns within the market. As a result, the price of the currency has since dropped. At the time of publishing, it is trading at $3,647, which is an 8.22 percent drop in 24 hours. Subsequently, its market value is now worth $60.4 billion. Favourably, though, over a seven day period, its value has risen by 8.88 percent. This is according to gold investor John Hathaway. He is the latest individual to speak out against the market in a new report. 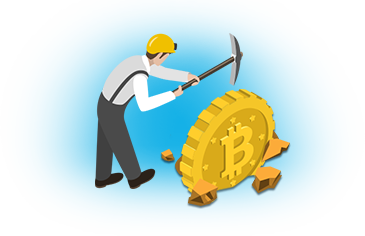 Some have speculated that interest in bitcoin is taking away interest from gold. Mohamed El-Erian, Allianz’ chief economic adviser, is one such figure to voice these concerns. However, Hathaway doesn’t believe that’s the case. It remains to be seen whether Dimon does face any repercussions from his bitcoin fraud remark. However, he will be hard pressed to find people who don’t think his comments impacted the currency’s price and reputation. For now, we just have to wait and see. There are, however, a number of factors affecting bitcoin’s price, which it’s currently struggling to recover from. The U.K.’s financial regulator has issued a warning to bitcoin traders over the frenzy created by initial coin offerings (ICO), some of which are being promoted by celebrities such as Paris Hilton and boxing champion Floyd Mayweather. The Financial Conduct Authority (FCA) has said that traders investing in ICOs should be prepared to lose all of their money. Furthermore, they should be aware that some may end up being scams. The FCA’s comments come at a time when China recently outlawed ICOs in the Chinese nation. China has also said that it plans on banning the trading of digital currencies on domestic exchanges. At the beginning of September, the ban was backed by seven of China’s regulators. It is hoped this will stamp out fraudulent fundraisers. According to a report, Beijing and Shanghai have seen an increase in ICO trading. So far, this year has seen the launch of 65 ICOs. This has raised around $400 million from 105,000 investors. When someone invests in an ICO their money goes up when the coin’s value increases. To date, bitcoin has more than quadrupled during 2017. At the beginning of the year bitcoin was valued at $1,000. Yet, at the start of September it had risen to $5,000. As of the 13th September, bitcoin is trading at $3,902. It’s believed that China’s plans for digital currency exchanges is impacting the price of bitcoin. Ethereum has also seen its value rise. At the beginning of the year it was trading around $8. Now, though, it’s valued at $260. As a result, traders are willing to speculate and put their money into ICOs. Of course, because of the market’s rise in value many ICOs are taking advantage and are simply scams to steal money. China’s regulators believe that the issuance of token sales is illegal. As a result, they are keen to crackdown on fundraising activities in the country. Since the ban, one Chinese over-the-counter (OTC) trading service for digital currencies has frozen its activities. BitKan said in a post that it would be suspending trading on the 14th September at 12:00 a.m., Beijing time. This is due to increased pressure from authorities. However, it didn’t mention when it would resume services, if at all. The move from BitKan is interesting as OTC traders may be excluded from the ban. The ban, at the moment, only impacts exchange-based trading. The increase in ICO trading is partly down to celebrities promoting them. This, in turn, is causing a frenzy as new investors jump on board. At the end of July, boxing champion Floyd Mayweather took to Instagram to promote an ICO. 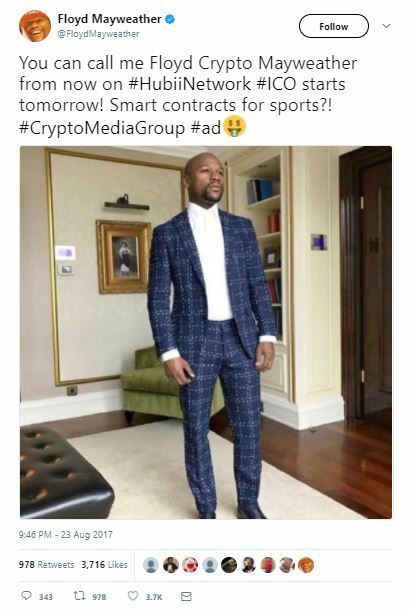 In the photo Mayweather predicted that he would make a lot of money in the ICO for Stox, a prediction market project, which launched at the beginning of August. In its token sale, Stox went on to raise $30 million. At the end of August, Mayweather then promoted his second ICO on Twitter. This time it was for the token sale of the Hubii Network, which is developing a blockchain-based content marketplace. He also mentioned the hash tag #CryptoMediaGroup, but didn’t elaborate. 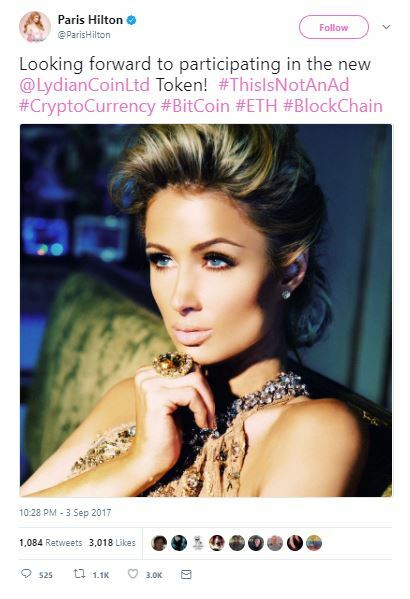 Celebrity heiress and reality TV star Paris Hilton is the latest celebrity to jump on the ICO band wagon. On the 4th September, it was reported that Hilton had announced her participation in a token sale. This is according to the director general of the Chinese central bank’s research institute. He added that the blockchain is a ‘good technology’ and that an ICO is not the only way to research it. For many, this move from China will be considered further interference from authorities keen to curb the market. For others, however, it’s a step in the right direction. David Moskowitz, co-founder and CEO of blockchain-powered social network Indorse, said that it would help to protect consumers from fake ICOs. Billionaire bitcoin critic Howard Marks has reviewed his opinion on bitcoin, admitting it could be a legitimate currency. At the end of July, the founder of Oaktree Capital Management wrote a 22-page memo to clients stating that digital currencies aren’t real. His position on them couldn’t be questioned. This was because he firmly stated they they weren’t real three times. Furthermore, he believed people were investing in the crypto market for fear of missing out. He also claimed that digital currencies are ‘nothing but an unfounded fad or perhaps even a pyramid scheme.’ In a bid to deter people from investing in bitcoin he compared it to the tulip bubble. However, after warning clients away from the market, it appears he’s changed his mind. In a new 11-page memo to clients Marks started by saying that his previous memo had generated the most response in the 28 years he’s been writing memos. As a result, he felt it was right to respond and reflect given the time that had passed. Marks ultimately agrees that the digital currency can be accepted for payments and as a store of value. Yet, despite his new outlook on bitcoin Marks isn’t fully convinced. Even though he considers himself ‘less of a dinosaur’ regarding the currency he’s still not investing in it. Given the growth of bitcoin in the past nine months it remains to be seen whether Marks will eventually invest in it. The value of bitcoin has soared to uncharted heights throughout 2017. As a result, it recently scaled the $5,000 mark. Such a milestone was monumental to the currency and those backing it. 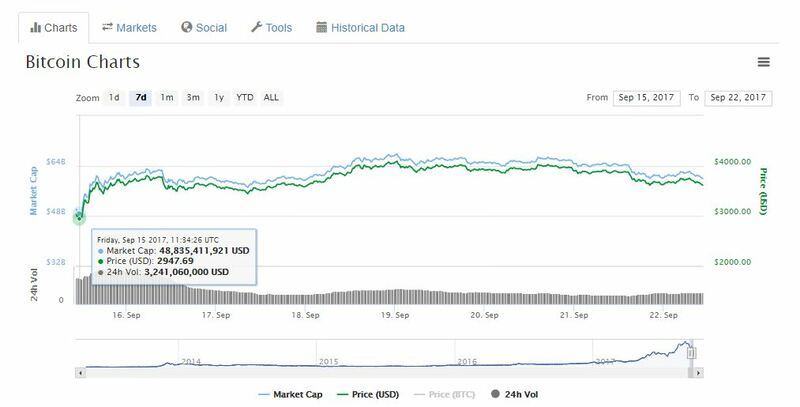 However, as of the 11th September it is trading at $4,186, according to CoinMarketCap. In a 24-hour period its value has risen by 2.09 percent, but in seven days it has fallen by 1.95 percent. This price drop is believed to be because of China. The country recently announced the banning of initial coin offerings (ICOs) to prevent financial fraud and illegal fund-raising. As a result, the news has seen bitcoin’s value drop by nearly $1,000. On the 10th September, uncertainty over a Chinese report that the country may shut down exchanges saw bitcoin fall to $3,950. As can be seen it has slightly recovered in price. According to the Wall Street Journal, the ban is expected to be limited to exchange-based trading and not over-the-counter transactions. The report states that China’s central bank – the People’s Bank of China (PBoC) – has drafted a draft, which will prevent Chinese platforms from providing virtual currency trading services. It is because of situations such as this that volatility in the market remains. With people unsure of what China’s next step will be, many are selling off their coins now. According to Yale economics professor and Nobel Prize winner Robert Shiller, the digital currency resembles that of a bubble. Known for his work on bubbles in economics, Shiller claims that bubbles are brought about by stories and not metrics. Of course, despite government curbs to control the digital currency market, they will remain. This is the thinking of Mark Mobius, executive chairman of Templeton Emerging Markets. He said that the crypto market is gaining prominence because they provide a fast way to transact with. 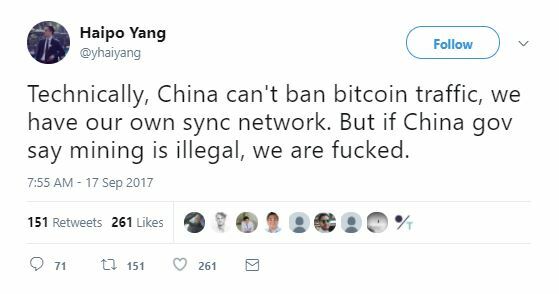 Yet, he believes that China is ‘ahead of the game’ in stopping ICOs as there is the danger of them being used by terrorists. However, while there are attempts from governments to curb the market it’s unlikely that they will disappear anytime soon. The market is going through an interesting phase for many market watchers. As such, it remains to be seen what will happen in the weeks and months that follow. The jury is still out regarding China’s decision and while bitcoin has risen in price from the 10th, it’s still feeling an impact. For the time being, however, Marks has given a small nod of approval toward the currency and that can only be seen as a good thing. Coinbase is witnessing a rise in the number of customer complaints as investors get excited about the rise of bitcoin’s price. Founded in June 2012, Coinbase has become a leading digital currency wallet that is supported in 32 countries. The San Francisco-based exchange has 9.8 million users and 32.8 million wallets. Since its founding it has seen over $20 billion in digital currency exchanged. Yet, despite Coinbase’s popularity the number of customer complaints it has received is rising. According to the U.S. Consumer Financial Protection Bureau (CFPB) it has received over 330 complaints about Coinbase in 2017. This is compared to the six it received in 2016; seven in 2015; and one received in 2014. The latest complaint it received was on the 30th August. This rise in complaints is likely to be due to a rise in digital currency users. With bitcoin’s price increasing more people are keen to jump on board and trade in the currency. Consequently, longer processing times are being experienced. Many of the issues about Coinbase are that the exchange is not delivering customers’ money to their accounts when promised. Since founding in 2012 the number of users using the exchange has increased. As a result, so too have the number of issues it has had to manage. On the 12th June, the exchange suffered a major outage after experiencing an influx of investors. Traders who went to the site were greeted by a ‘service unavailable’ notice for a few hours. This was around the time that bitcoin’s price had scaled the $3,000 mark for the first time. The previous week it had been trading between $2,700 and $2,900. For many users who wanted to sell their coins amid the new high price weren’t able to. After the digital currency had soared $3,000 it then fell to $2,532. Naturally, those who wanted to sell their bitcoin took to social media to voice their displeasure. This, however, wasn’t a one-off occurrence with the exchange. At the end of May, the exchange revealed that it was downgrading its performance for some users. Yet, while Armstrong laid out steps for improvements on the exchange it seems that complaints will continue for a while. Bitcoin is currently trading over $4,300 and is continually attracting new investors. As such, the number of people using Coinbase will keep rising. However, while the company has an issue with its transaction times it doesn’t appear to be reducing it user numbers. At the time of publishing, on the 4th September, bitcoin is trading at $4,310, a 4.35 percent drop in 24 hours. Over the past seven days its value has decreased by 0.18 percent. Its market cap value is currently worth $71.3 billion. The combined crypto market is worth $148.2 billion. This is a slight drop from its previous $164.4 billion market value on the 29th August. Bitcoin has been experiencing an incredible rally during 2017. With four months left of the year it remains to be seen what else it can produce. However, confidence in the currency is increasing. So much so, that plenty of people have predicted where they think its price will go to. Veteran trader masterluc believes it will reach $15,000 by the end of 2017. This figure is certainly a bullish price, but illustrates the confidence of where many see the currency going. Ronnie Moas, Standpoint Research founder, is another individual who has predicted a bright future for bitcoin. According to him, he thinks bitcoin’s price will reach $7,500 next year and projects each coin to be worth $50,000 by 2027. Whereas, Dennis Porto, bitcoin investor and Harvard academic, thinks it will reach $100,000 by February 2021. These price projections are just a few from analysts on where they see bitcoin heading to. Despite the fact that it is still relatively new, the digital currency is storming ahead. As such more people are investing in it, which is playing a role in its price. No doubt there will be plenty more price swings in bitcoin’s future, but as long as demand remains it will continue to flourish. Who knows what the future will hold for the digital currency, but with such high confidence in it, it doesn’t appear to be going away anytime soon. All we can do is wait and see what happens next.